Ginger is one of the most commonly used spices in the world and has a long history as a flavoring agent and natural medicine. While this Asian root is consumed in many forms, one of the most popular ones is dried ginger. 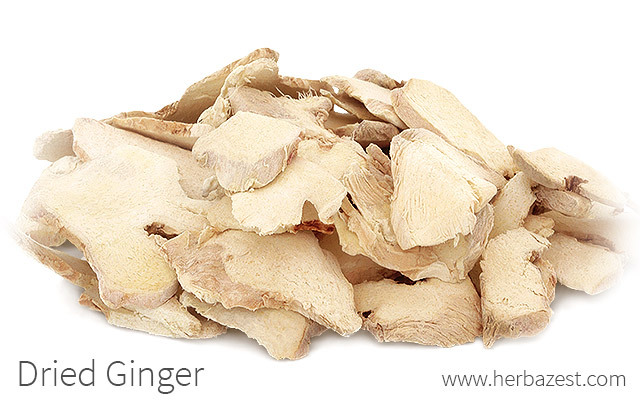 Raw ginger has high levels of gingerols, which are the predominant phenolic compound found in this herb. However, when dried, many of the gingerols are converted to shogaols. While shogaols have the most potent medicinal effects, the heat and drying process will destroy much of ginger vitamins, especially vitamin C, which is particularly rich in fresh ginger. As shogaols are slightly more pungent than gingerols, dried ginger has a spicier flavor than raw ginger. When stored in a cool, dry, dark place, dried ginger can be kept for up to a year. In contrast, raw ginger should be stored in cool, humid environment (approximately 50F or 10C) and it may last up to 28 weeks. Rinse the ginger root to remove dirt. Using a knife or vegetable peeler, remove the skin of the ginger root. Slice the ginger finely or grate it using a cheese grater. Spread the sliced or grated ginger evenly on a baking sheet and leave it on your kitchen counter or in a sunny, dry place. It can take between two and ten days, depending on the climate, for the ginger to dry completely. Store the dried ginger in an airtight container. Alternatively, you may use a food dehydrator set to 90F (32C). This method will take approximately one to four hours. Dried ginger can also be powdered using a food processor, coffee grinder, or mortar and pestle. Once dried, this Asian root can be steeped to make ginger tea, pulverized and enclosed in ginger root capsules, or sprinkled on food. Dried ginger is commonly used as a spice and flavoring agent in cookies, cakes, and curry mixes. It is recommended that adults consume no more than four grams of ginger a day, while a daily dose of one gram should be the limit for pregnant women. Be sure to consult your doctor concerning the right dosage for you. Ginger should not be given to children under the age of two. The active constituents of ginger tend to accumulate in the gastrointestinal tract, making dried ginger highly beneficial for treating nausea and vomiting. Ginger is often used to soothe upset stomachs and the symptoms of the common cold. Respectively, studies published in The Lancet (1982) and Obstetrics and Gynecology (2001) have shown that dried ginger is superior to dimenhydrinate in reducing motion sickness and morning sickness in women in the early stages of pregnancy. It is widely common to use ginger for inflammation, to counter headaches, migraines, and swelling. Research published in The Journal of Pain (2010) suggests that ginger may reduce muscle pain, while another study from Arthritis and Rheumatism (2001) showed the significant effect of ginger in reducing the symptoms associated with osteoarthritis of the knee. Dried ginger is available for purchase at many grocery stores, natural food stores, natural health and nutrition stores, drugstores, and online. Among the many uses ginger is good for, the dried root can be added to a variety of foods or even taken as a supplement. The healing properties and culinary advantages of dried ginger make it an essential part of any medicine cabinet or spice rack.